I won’t be posting casual outfits every Friday (in case you are wondering), but I am posting this one for two reasons. First, this outfit includes SS2015 clothing and accessories. Au courant! 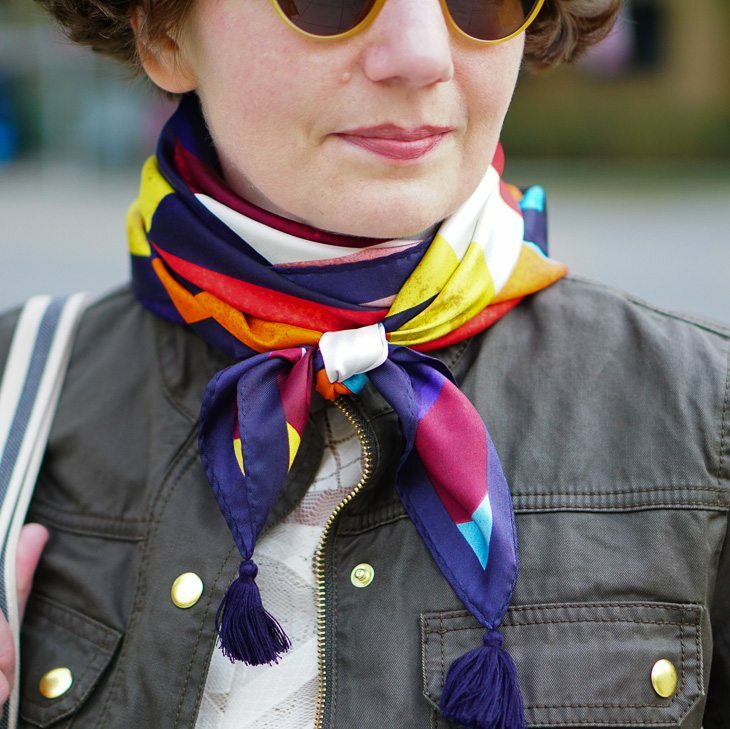 Second, the components of this outfit are basic pieces that can be found every year in a variety of fabrics and colors. These components, once acquired in a few of those varieties, can be assembled to create lots of smart outfits for casual Fridays, office retreats, and museum-going on the weekend. A teachable moment! 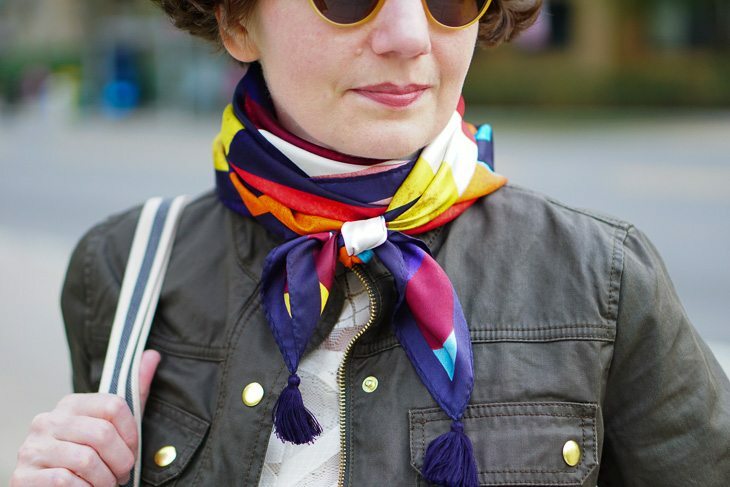 The heralded components are: an interesting top, a little jacket, a large scarf, jeans, and a casual bag. 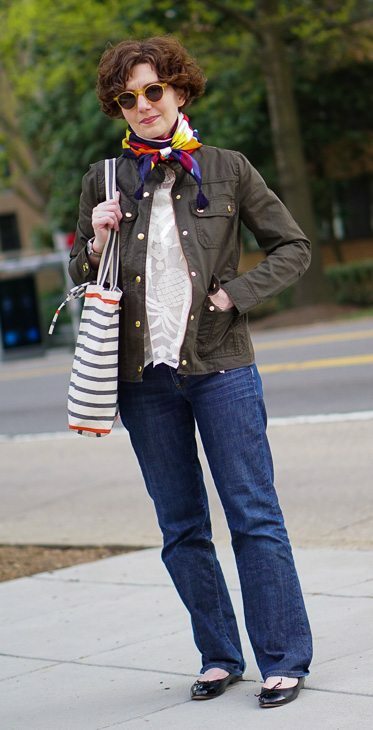 I saw this jacket — which has been a JCrew staple for years — on sale several weeks and worried that the style was being discontinued, which prompted me to buy one. 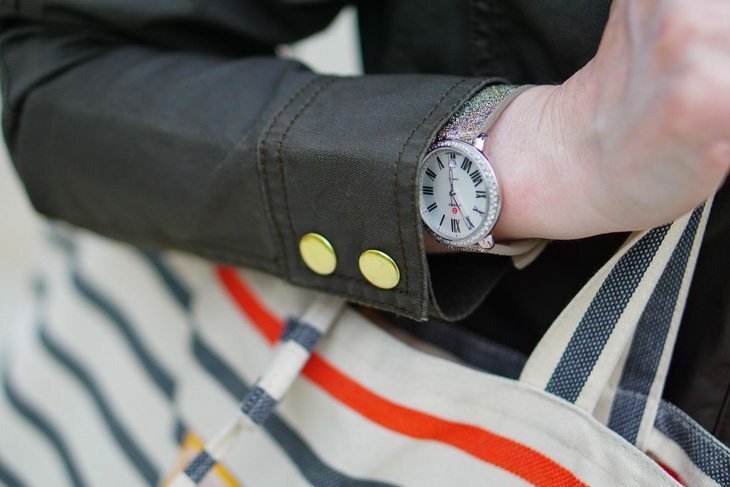 Part 5: a striped tote and special bonus: glitter watch band; I skipped Part 4 because you’ve got jeans covered, right? I decided that the dots finishing the pointed hem were a little twee for a 45 year old. So snip, snip, snip. Tulle is so easy to work with; no hemming required. But tulle is sheer. As the clerk who sold this blouse to me pointed out, It’s lined! 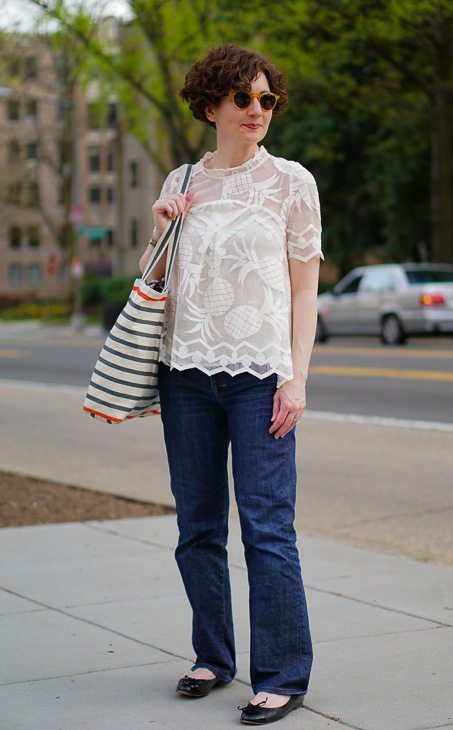 I didn’t have the heart to tell her that the blouse is, notwithstanding its lining, as transparent as a bridal veil. So I went to the lingerie department at Neiman Marcus in search of a camisole. The saleswoman there asked me whether I wanted a liner or a layer and I just blinked. It was one of those moments when I realize I am so far out of my depth that not only do I not know the answer, I don’t even understand the question. I learned that a liner is intended to be invisible and a layer is intended to be seen. 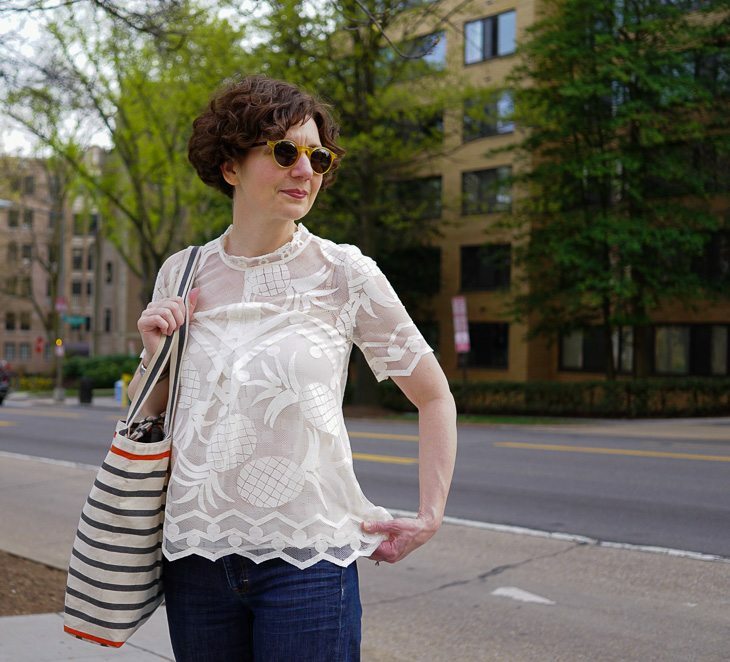 Because this blouse has an inverted V yoke, I opted for a liner — to avoid creating layers of contradictory necklines. This liner from Commando is brilliant. Your blog is brilliant (smart and funny) and beautiful! A post I had missed! I love this blouse.